Not Verified | Always book Option Plus. It allows seat selection, express check in, extra baggage, priority baggage handling, meal, drink, blanket and headphones. Always book the 2 seat section at rear for extra room. ✅ Trip Verified | Our seats were 2H and 2K. I sat in 2K. 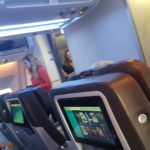 The seats are in the club class cabin. The first thing that struck me was just how much shoulder room I had. I could actually sit in a completely relaxed position with my arms at my sides and neither me nor my fiancee touched arms unless we chose to. Last time we flew we spent the entire flight in a really awkward human sandwich with a stranger in the aisle seat. The next thing is the leg room. There's actually a little hanging footrest under the seat in front to put your feet in and it's comfortable enough. The recline of the seat back is decent as well. I had no difficulty getting comfortable. The in-flight entertainment system was great. It had a little remote that controlled the pointer in the screen and gave the ability to just lie back and use the controller without having to lean forward to change selections or adjust settings. Small detail but a good one. The only issue for me is still seat spacing. When you need to get up to get to the aisle it is a tad easier to do but it still requires a cautious effort. All in all it's a great seat and more than comfortable enough. 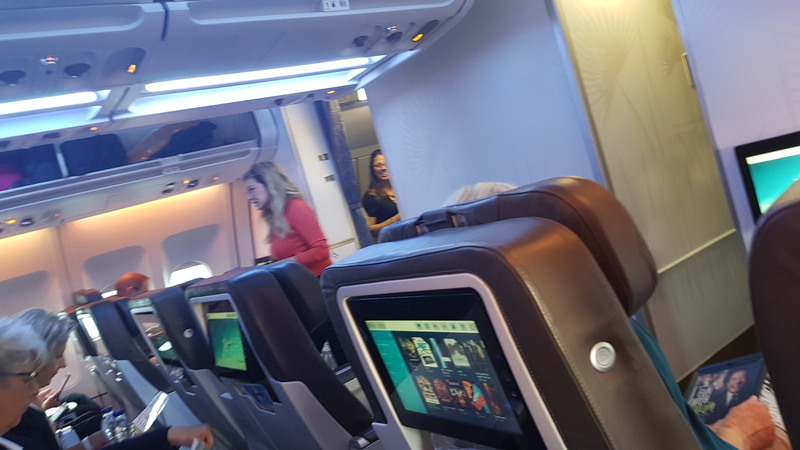 Our connecting flight ended up being a substitute by Hi-Fly on their A340-300 with Emirates old 1st class cabin and even with the insane leg room it offered, I still prefer the club class seat as it was wider and for me, that's huge because I like my shoulder room. 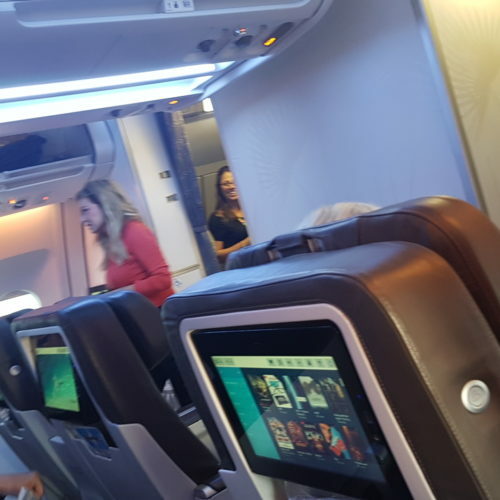 "Not what we paid for"
✅ Trip Verified | The seats in Air Transat Club Class were supposed to be wide spacious leather 2x2 seats as pictured on their web site. Instead they were cramped non-leather economy seats with the middle seat vacant. Not what we paid for. I always fly with Canadian Affair it used to be the Thomas Cook flights but for the last few years it is Air Transat. I cannot fault them, seats are fine, I always like an aisle seat for getting up and down to stretch my legs. Also I am Coeliac and the meals are nice cannot say anything bad about them airline staff on plane very nice. I flew with them again last September from Glasgow to Toronto to visit family. And hopefully will be flying with them again next year. "sitting on a concrete pad"
Narrow seat - the lady next to me (not a big woman) and I were elbow banging the whole flight. Leg room about what someone 6'2" has learned to expect. The seat bottom is like sitting on a concrete pad. The lumbar support is positioned perfectly to induce back aches. It appears that no matter your size, the support is not positioned correctly as I spoke to other passengers and they were complaining. This Air Transat flight was operated by Enerjet, and the most uncomfortable flight I have had in years. No leg room, narrow aisle, front passenger reclines right in your lap. Stewards allowed oversize baggage in overhead bins, so we had no room for our small carry on. Did not pre board people with children so we waited a long time on the breeze way. Not at all happy. 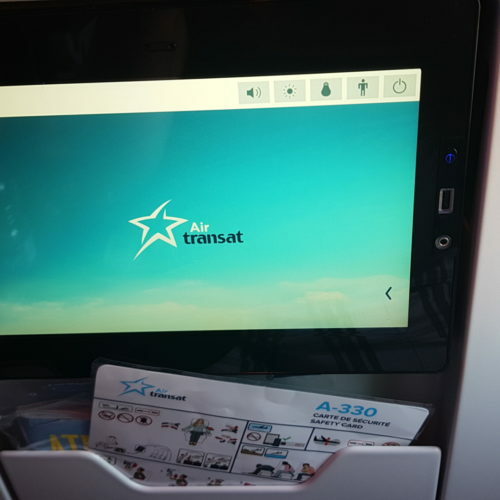 We have flown quite a few airlines over the last few years and Air Transat is not bad, but its not good either. Firstly the seats, flying this airline you are going to get well acquainted with the person at the side of you. Most airlines we have flown use a 2x4x2 configuration which is ok, using a 3x3x3 means you are very cramped. We flew a different airline earlier in the day with the 2x4x2 in the same body and it was much more comfortable. I am 185 cm and I have broad shoulders and I was very uncomfortable for the transatlantic flight. The width of the isle was so narrow that I was not possible to pull my hand luggage along the floor. You will have to pay for a blanket and headphones on this airline. The in flight entertainment system is ok; full touch screen, but a limited number of movies and shows. The service was good, but it was obvious that the flight attendant was not fluent in French when making her announcements which for a dual language airline is not what you would expect. The attendants were friendly. Food was ok, but there was not enough. Flying this airline again I will make sure that I eat plenty before the flight! Overall I think it would be better to pay more for an airline with better service. "seats were hard, slippery, narrow"
Calgary to Gatwick, 1st July 2015, Airbus A330. The only good point about this flight was the condition of the aircraft. 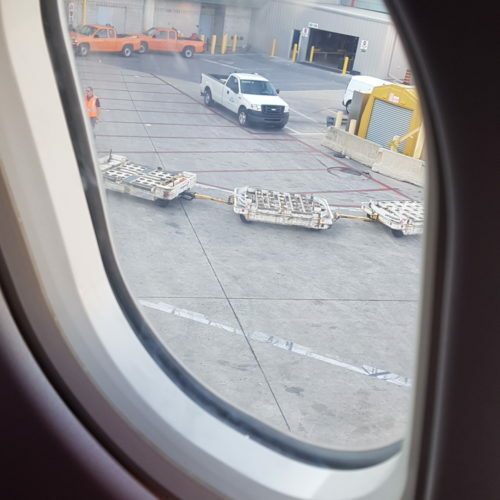 However, the seats were hard, slippery, narrow and very uncomfortable.The cabin crew were rude and unhelpful, not a a hint of "please" or "thank you" at any time. The food was diabolical and very little of it. (eg. a slice of Banana Bread for a "snack" breakfast) The air travel side of our Canadian Holiday should have been one of the highlights, instead it turned out to be the only regret. "seats become very coccyx unfriendly"
London to Calgary and back again. Seats become very coccyx unfriendly after an hour or so. Either the seat or I don't have enough padding. Spent most of the flight wriggling around trying to find a comfortable position - and failed. I'll avoid this plane type the most uncomfortable I've ever experience in future. 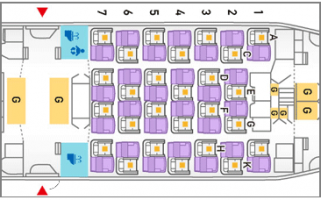 The seats in twos at the rear of the aircraft are the more comfortable in economy.